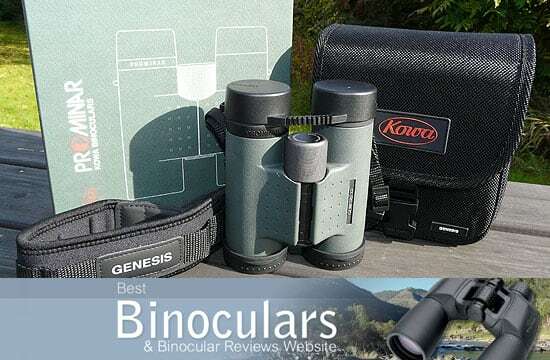 Having already reviewed the full sized Genesis XD 10.5x44 binoculars, I knew that I was in for a real treat with these more compact Kowa Genesis 10x33's. Whilst the full sized Genesis binoculars with their larger than standard 44mm objective lenses are excellent binoculars, some of the very best and brightest that I have ever reviewed in fact, they do have one down side and that is their weight. So I wondered would the smaller, more portable version not only feel lighter, but also retain at least some of the incredible brightness of the larger version? Aimed at the top end of the market, the Kowa Prominar Genesis XD 10x33 binoculars are manufactured in Japan and just by the look and feel of these binoculars as you take them out of the box, you can tell that this is a high quality pair of optics, manufactured using the highest standards as well as the best quality components available. The body of the binoculars is made from magnesium alloy and covered in a rubberized armour that give you a tough binocular that should easily handle most conditions that you throw at them. The rubber armour on these Kowa Genesis binoculars as well as most other quality optics have a number of benefits apart from just protection. It also provides a good non slip surface even in wet or damp conditions and it also helps to dampen down any sounds that may be made by knocking them against anything. For example my wedding ring can make a rather loud metallic sound if I brush it against another metal object, which could easily frighten away timid wildlife or birds. What is also interesting is that even though they are light, you still feel that you are holding a solid, quality binocular in your hands, and not some sort of cheap plastic imitation. One feature that helps promote this feeling of quality when you use them is the almost "beautiful" metal central focusing knob. It may be a small thing, but I love it and not only does it look and feel great, but focusing was really smooth. These Kowa 10x33's take one and a half turns of the dial to go from infinity to it's near focus which is an excellent 4.9 feet (1.5m). 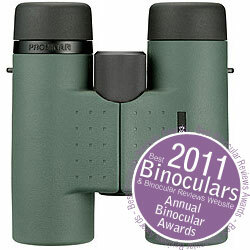 Most binoculars that I have tested either take only one turn or two full turns or more. The aggressive mechanism on binoculars that only take one turn to go from one extreme to the other, does make them fast to focus, but can make them hard to fine tune the focus. Whilst the low gearing on binoculars that take two turns or more mean that it does take a little longer to go from one end to the other, but they do have the advantage of a good fine focus. However the extra time taken could mean missing what you were trying to spot. I feel that Kowa have really found the right balance here. Fine focusing was simple and accurate, whilst I could quickly go from looking at a butterfly perched on a flower right next to me to looking at a distant eagle soaring above. The lockable diopter control is again another really nice touch and another sign of the quality and attention to detail on these optics as it prevents you from accidentally changing your setting. To adjust it, you unlock it by pulling it away from the barrel and then you can twist it to correctly set up the binoculars to suit your particular eyesight and then click it back to lock it in place. The Kowa Genesis XD 10x33's have comfortable twist up eye-cups provide you with a good 15mm of eye-relief, which means that they just miss out on my own personal benchmark of "Long Eye Relief binoculars", but should be plenty enough for most eyeglass wearers. Here again you can notice the quality as they seem to be made from metal with a rubber coating, rather than just made from some sort of plastic that you find on cheaper optics. The eye-cups have 4 click stops - flush against the eyepiece, two intermediate stops or fully extended. Non-eyeglass wearers will just use the eyecups in the fully extended position, whilst eyeglass wearers can adjust them to suit what works best for them. On top of this they are completely sealed and filled with dry nitrogen gas to prevent them from fogging up and mean that they are 100% waterproof. The outstanding feature of all the Kowa Genesis XD Binoculars is their PROMINAR XD lenses (extra low dispersion glass), this technology has been taken from the top of the range Kowa Spotting scopes to produce binoculars, that are according to Kowa chromatic aberration free. On top of this they have paired these XD lenses�on the two binoculars in the XD33 series with convex lenses made of glass that also has special dispersion properties that is said to reduce chromatic aberration even more. These ultra high quality lenses are not cheap to manufacture and so are only used on Kowa's top end binoculars, the result however is an extremely bright image with high contrast. Before testing them, I had hoped that even though they have a lot smaller objective lenses than their big brothers in the XD44 series, that they would at least retain some of their brightness. I was not disappointed as not only are the colours and clarity of image produced stunning, but for a 10x mid-sized binocular the brightness of the image is truly excellent. Comparing them to my mid priced 10x42 benchmark binoculars, that I use for all my reviews, they were far, far brighter and you must remember that the benchmarks have much larger 42mm objective lenses. Excellent! As with any binocular in this price range you would expect them to have BAK-4 prisms that are made of superior optical glass to produce clearer images, but Kowa have gone one step further in that they use the Schmidt-Pechan prism design that have both BaK4 and SK15 prisms. This prism design, like roof prisms is more compact than a porro prism binocular, but does have a few drawbacks one of which that the two prisms are separated by an air-gap and one surface of the Pechan prism does not provide total reflection. To get around this Kowa have added their own highly reflective multi-coating that they call C3 coating that they say give a reflectance of 99% or more across the entire visible spectrum. 10x32 binoculars have an Exit Pupil of 3.2mm and a Twilight Factor of 17.9, whilst these 10x33 binoculars have a slightly improved Exit Pupil of 3.3mm and a Twilight Factor of 18.2, suggesting that these should perform slightly better in poor light conditions. It is important to remember that whilst these figures make it possible to compare the performance of different configurations of binoculars in low light conditions, they do not take into account the quality of the prisms, lenses and their coatings. But as I have already mentioned these Kowa Genesis binoculars feature the very best quality optics available which is why they produce such a bright image. The field of view at 1000 yards is 357ft (119m@1000m) is good and is comparable to most top end mid sized roof prism binoculars with a 10x magnification. They have a close focus distance of 1.5m (4.9ft). Anything under 6ft is excellent and beats most other binoculars in their class and even competes with binoculars specifically designed for things like viewing butterflies. These Genesis binoculars come with a good quality soft carry bag that is very well padded and comes without a carry strap. This may sound bad, but with the binoculars in the case you just use it's neck strap which in my opinion makes for far less clutter and works very well. Whilst the humble neck strap does not usually warrant having it's own title on most of my reviews, I think that the one that comes with the Kowa Genesis is that good that it is well worth bringing to your attention. What I like about is that it is very well made, has a thick sponge padding and at the point where it rests on your neck is wide enough to distribute the weight over a larger area, making carrying the binoculars very comfortable. Once again it is another sign of quality and shows that Kowa have not forgotten the fine details by finishing off their optics properly rather than it just being an afterthought. The Genesis objective and eye piece lens caps on my pair fitted well and should not accidentally fall off. I really like the fact that the objective lens caps are tethered to the barrels of the binocular. I am always misplacing my lens caps and this really helps. If you don't like them attached to your optics, they can also be removed, so everyone is a winner! Also included is a lens cleaning cloth, some instructions and your warranty card. Below is a table comparing some of the main features of the Kowa Genesis 10x33 XD binoculars with what I believe to be the market leaders and what this Kowa is competing with, the Swarovski 10x32 EL Binoculars and the Nikon 10x32 EDG. So as you can see all three binoculars are fairly evenly matched and all three have their strong and weak points. Strong points for the Kowa XD 10x33 is it's price, low weight and really good short focusing distance. I rate these Kowa XD binoculars very highly, their low weight, very close focusing distance and extremely bright image are real highlights. I also love the overall build quality and the attention to detail that give you the great feeling you get that you are holding a quality pair of binoculars in your hands. They are ideal for nature observation and because of their mid size make excellent safari binoculars, travel binoculars are easy to put in a bag and take to sporting events or for anyone looking for a lightweight field binocular. They will also work well as general use optics. The incredible quality of the optics mean that the view through them is nothing short of sensational and definitely some of the best and brightest mid sized binoculars with a magnification of 10x or more that I have ever used. They feel great in your hands and are well balanced and the rubber coating is very comfortable to hold. Negatives? To be honest I am trying really hard to come up with any! Whilst they may not be the cheapest binoculars on the market, if you compare them with other top of the range binoculars in their class they are some of the cheapest, Add to this all their quality components, their excellent build quality and great features, I think it makes them excellent value for money. Theses are definitely one of my favorite binoculars out there, but if the price tag is still a bit too steep for you, you may wish to consider something like the Minox 8x33 BL Binoculars, that whilst many not quite scale the heights of these are still an excellent pair of optics and another favorite of mine. Nikon's fantastic ED glass lenses, advanced multilayer coating as well as compact and light, these are exceptional binoculars. Discount Binoculars: The Kowa Genesis 10x33 is available at a reduced price from Eagle Optics in the USA and Amazon.co.uk in the UK.